One of the many ways The Sunflower Fund raises funds and awareness is through campaigns like Sunflower Day. Sunflower Day is all about rallying support for individuals diagnosed with life-threatening blood diseases like leukaemia. 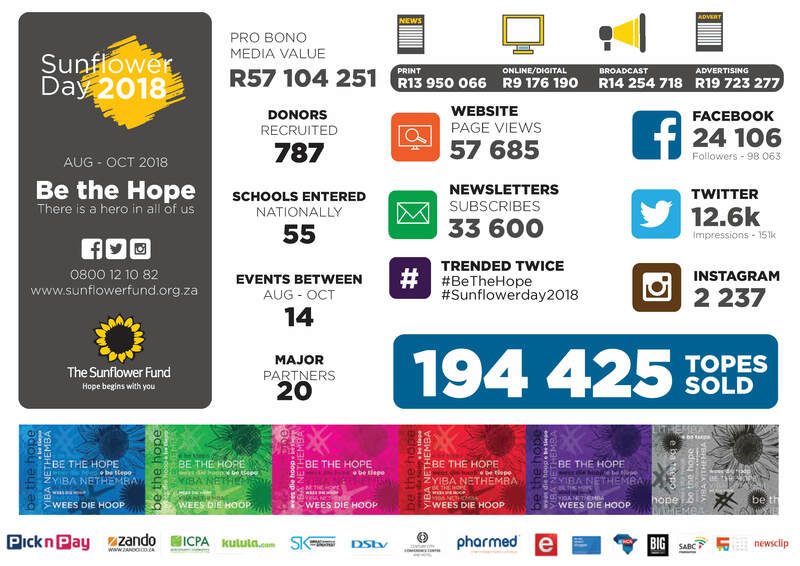 Over the past 16 years, it has grown beyond the sale of TOPES to an open source campaign through which schools, corporates, supporters and the general public celebrate Sunflower Day and raise funds for The Sunflower Fund. Sunflower Day (20 September) is on the South African Health Awareness Calendar for 2019. The campaign is a national integrated marketing and awareness campaign across a number of channels including traditional, online, social media, outdoor advertising, donor drives and events. TOPES will go on sale first week in August and you can buy your TOPES from Pick n Pay, Zando, and Independent Community Pharmacy Association (ICPA). An affordable, multipurpose article of clothing retailing at R30, and can be worn as a headband, mask, scarf, cap or arm-band. Being broadly versatile, it may be used in a wide variety of sports or outdoor activities and will be available in six eye-catching colours. The TOPE offers practical functionality for the entire family and also gives wearers the opportunity to show their support for this important cause.